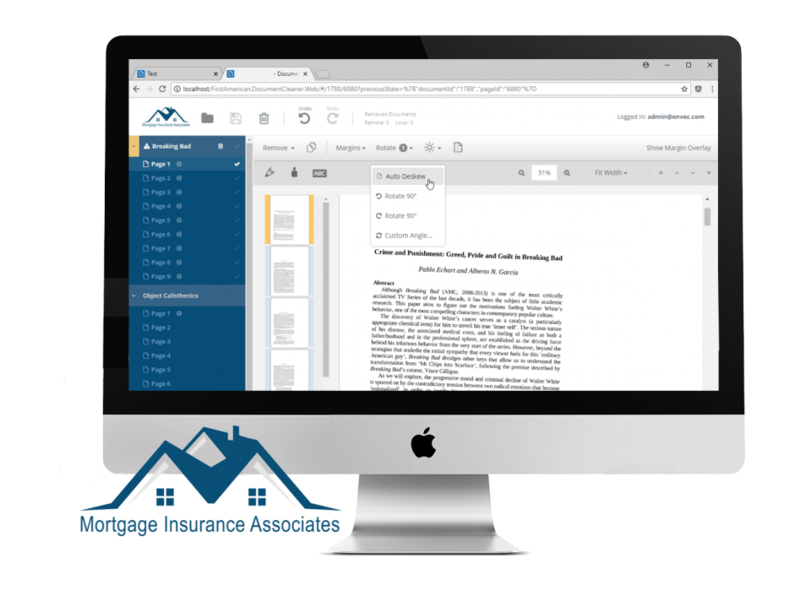 Atalasoft, a document software toolkit company, recommended Envoc to a California-based insurance company called Mortgage Insurance Associates (MIA). Atalasoft was impressed by the many projects Envoc completed showcasing the Atalasoft toolkit, so they knew we were the best choice for MIA. With millions of real estate transactions occurring every year in the U.S., there are many potential risks associated with mortgages for both lender and borrower. MIA provides protection for both parties involved in homeowner lending, but the process requires hundreds of documents to be analyzed, stored, and shared with multiple agencies and local governments. Underwriters of title insurance rely on the analysis of many public and private records that originate as paper documents. Scanned copies of these records are critical artifacts used to determine the insurability of a property. MIA shares these documents with other agencies and local governments, all of which have their own strict formatting requirements for these records. The company was expending excessive time and money to clean and format these documents manually to meet these requirements. MIA needed a way to streamline the process, but they had no idea where to begin. Frequent communication with MIA was critical throughout the development process. This gave our developers an opportunity to continually learn the business intent behind new features and deliver exactly what was needed. To ensure our vision matched their needs, we generated wireframes and process diagrams for some of the more advanced features. Next, our developers employed a divide and conquer strategy, attacking the system as two mostly-independent components: FrontEnd Interactivity and BackEnd Processing. By focusing on the user interface separately, our devs could isolate all parts of a feature that were tangible to the end user. Thus, we could efficiently elicit feedback from the client (e.g. about intuitiveness) without having to wait for the full implementation of each feature. With another team focused on backend processing, our devs could isolate low-level capabilities that were critical for success but far removed from human visibility. This included the core image processing, the file storage infrastructure, and communication with the central document repository. This isolation allowed the development team to prototype and test the effectiveness of communication protocols and calculation-intensive tasks without getting distracted by the user interface. This development strategy allowed the client to see quick results, efficiently provide feedback to the team, and receive a deliverable that was exactly what they needed in a timely manner. MIA has an established central document repository for their scanned documents. It was important that the Document Cleaner be able to receive documents from this repository as well as send them back after an editing session. The Cleaner queues a list of documents to be edited in a single editing session along with all metadata that describes formatting constraints. With the multi-document view, users can move pages between documents via drag and drop, duplicate pages, denoise selected pages, rotate by an arbitrary angle, brighten regions, apply automatic formatting correction, apply resizable, rotatable, layering whiteouts and redactions, apply resizable text annotations, and view calculated margin requirement overlays across all pages. The Envoc developers created a set of unique algorithms that drive image analysis as well as automatic reconstruction of images to fulfill specific document formatting requirements. With the advanced formatting view, each page has a calculated semi-transparent overlay applied to it to show the current formatting rules. From the moment documents are populated into an editing session until they're exported back to the source repository, formatting errors are flagged. Finally, because of the intricacy of editing tasks and because several processes must be applied successively, it was important to give end users leeway for experimentation and mistakes. Thus, unlimited undos and redos within editing sessions is a core capability.